KAI, founded in 1987, is located in Shinjuku, Tokyo. Don't you want to study with students from more than 40 countries? Improve 4 language skills of reading, writing, listening and speaking in a balanced manner. 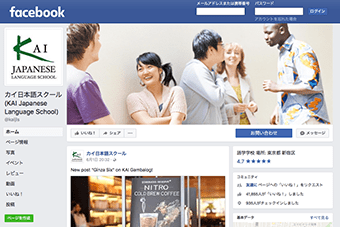 Recommended to those who want to master Japanese. From complete beginner to intermediate learners. You can use what you learn fom the day you do. Especially suitable for short-term learners. KAI, founded in 1987, is located in Shinjuku, Tokyo. It's very convenient since there are a lot of restaurants and shops near by. iMacs and Wi-Fi are available and a closed online student communicy is also provided. Everyone can find their wants and needs satisfied at KAI. We welcome complete beginners to upper advanced learners wishing to get a job in Japan. Improving 4 language skills in a balanced manner or focusing practical conversation on a shorter-term basis, etc. A wide range of accommodations on your requests. The choices include homestay where you can experience Japanese families, guest houses with lots of opportunities to communicate with people from various countries and weekly apartments if you prioritize privacy, etc. We understand you have a lot of questions when you think about coming to Japan to study. We are more than happy to assist you! Just feel free to make inquiries about our Japnese courses, accommodsations, visa or whatever you want! April 3, 2019 Deadline of early-bird discount for summer course July and full is coming up! November 12, 2015 important You can see the inside of school now! A global city, Tokyo, the tradition and pop culture co-exist. KAI has provided quality Japanese education in well-balanced multi-national environment since 1987. Why don't you improve your Japanese communication skill in Tokyo at KAI where various cultures mix? The school is located in Tokyo, the capital city of Japan. The nearest station is Shin-Okubo, the next stop of Shinjuku which is the most exciting area in Tokyo. It very convenient wherever you go. It only takes 10 mins to Shibuya and 25 mins to Akihabara. In addition, there are lots of restaurants and shops around KAI. KAI is enthusiastic about publishing information using the website as well as the blog and SNS. 25,000+ people all over the world like KAI on Facebook! Thank you! 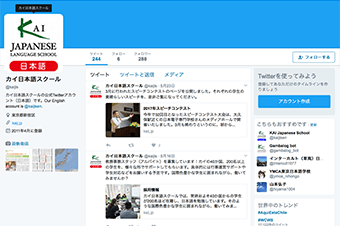 We write posts both in Japanese and English, so you all can enjoy reading. 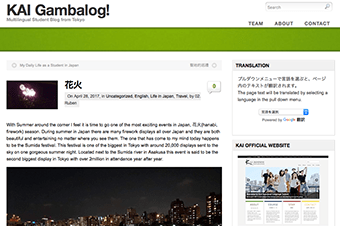 Multi-lingual student blog written by KAI students in their native languages. Great way to see their real student life in Tokyo at KAI! KAI has 2 twitter accounts; Japanese and English. This link leads to the English account. 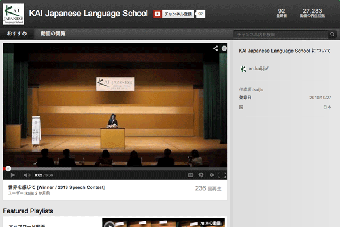 Enjoy watching the introduction of the school and lessons, speech contest, events such as parties, etc. If you have any questions, please feel free to contact us. Our English speaking staff are happy to reply to you. Your question may be already answered in our FAQ. Please check it too. Our contact forms are available in 13 languages, however the reply will be in either Japanese or English. You will usually receive a reply from our staff within 1 or 2 business days. In case you prefer speaking to our staff, please call us at +81-3-3205-1356 between 9:00am and 18:00pm (Japan time) on weekdays.